The Distretto Taormina Etna has been created to meet the requirements of a drastic change in the management and enhancement policies of local resources (agricultural and food products, tourist industry and cultural heritage) and it embodies a great number of tiny historical towns, rich in culture and abounding with folk and religious traditions, stand out against such a fascinating and pure context. An unrivalled naturalistic and cultural heritage to live, to know and appreciate. The Cultural Distretto Taormina Etna has been planned in order to be up for the Announcement Sviluppo Sud, promoted by the Milano Cariplo Foundation. It is a partnership headed by the municipality of Bronte and is into partnership with the leading officers for the territory local development which includes 61 municipalities from the provinces of Catania and Messina; the Development Agencies in charge of the management, negotiation and implementation of territorial plans (Sviluppo Taormina Etna S.p.A. and Società Consortile Taormina Etna a r.l. 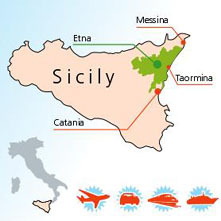 ), the Universities of Catania and Messina and the Cultural and Heritage Regional Office. The District has the objective of promoting sustainable development of local resources by activating synergetic dynamics: it can be considered as a propulsive power to preserve, enhance and draw benefit from the material and immaterial cultural heritage of the territory, a mission to accomplish by undertaking initiatives such as the IntegratedNetwork of Museums, the Creation of a Comprehensive Calendar of Festivals and Events, the drawing up of a Guide to Reading Religious Confraternities.